Level up your bumper plate game with the Vaughn Weightlifting color competition plates. And they're in kilos only, just like you'll be lifting on the platform! These plates were developed with Chad Vaughn, the two-time Olympian and current clean and jerk American National Champion. He wanted durable, affordable plates for training, and that's exactly what these are. Here's what makes these plates so great! 50.4mm insert diameter will fit most Olympic barbells. Matte finish with raised white lettering to easily distinguish labeling from a distance. Each plate is weighed and guaranteed accurate to +/- 3 grams to stated weight. Durometer rating of 90 ShA means these plates have a nice, dead bounce. 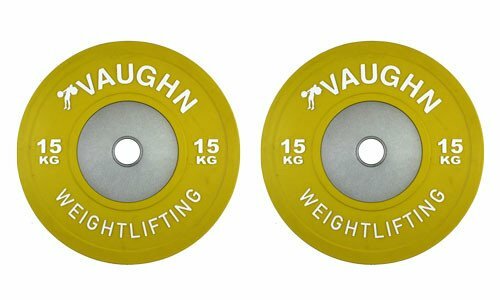 If you have any questions about this product by Vaughn Weightlifting, contact us by completing and submitting the form below. If you are looking for a specif part number, please include it with your message.